The matte black, retail pipeline fixture collection consists of a variety of different sizes and styles. Whether you are looking to outfit your entire shop in matching fixtures or just one section, our matte black pipeline selection is the way to go. Our pipeline fixtures are constructed from 1.25” round industrial plumbing pipe and a variety of plumbing connectors. The industrial plumbing pipe construction makes it durable and attractive. Pipeline fixtures are ideal for creating the modern urban retail display look. 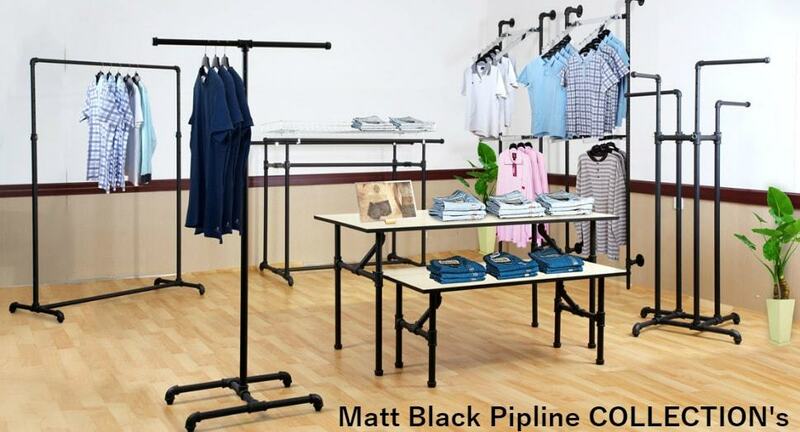 Our matte black pipeline selection consists of clothing racks, retail display tables, nesting tables, and outriggers. Combine all or just some of the pipeline fixtures and build your own urban retail showroom display.